(An analysis of Welsh media coverage of Welsh domestic football). Our readers cannot have failed to notice that we have strong views on the extent and nature of media coverage for 'real' Welsh football - the domestic game and, above all, the national league, the Dafabet Welsh Premier League. It's nothing new - supporters of the national league have been complaining about this ever since its foundation in 1992; and, as our 25-year life as a periodical publication virtually co-incides with that of the League of Wales / Welsh Premier League, the paucity of coverage in our Anglo-centric media has been the subject of regular editorial laments over the years. Meanwhile, in the public consciousness, top level football means the English Premiership. Football lovers and gamblers alike rarely see beyond it (just check out the current Matchbook bonus codes online to see what I mean. When we started out, in late 1991, the idea of a national Welsh league system independent of English football was controversial (even if not a new concept), in much the same way as Wales, politically, was then governed entirely by Westminster. But as our ideas of Wales have evolved, politically and culturally, in the last decade or two, and as devolution has helped to define Wales as a separate nation within the UK, that simply hasn't been reflected in attitudes within the world of football. Which is actually quite ironic, when we consider that football is actually one of the very few spheres of activity in which Wales has had, since the late 19th century, complete autonomy as a nation in its own right - as a member of FIFA and UEFA, a football association and a national team structure. Now I tend to see most issues through a football-shaped prism, and so, despite being acutely aware of the paucity of media coverage of Welsh domestic football, and the dismissive attitudes towards it prevailing in broadcast and print, I had not really seen these issues in any wider context of the UK and Welsh media landscape, and the policy that shapes it. However, I recently became aware of some academic work on the wider subject of the media in a devolved Wales: specifically, a paper/article entitled "Broadcasting after devolution: policy and critique in the Welsh media landscape 2008-2015" by Ruth McElroy and Christina Papagiannouli (both University of South Wales) and Hywel Wiliam (Advisors in Media). This work has recently been published in the International Journal of Cultural Policy (ISSN 1028-6632). On reading the article, it was immediately clear that there were some familiar themes under discussion. One of the central questions was "how the media serve people in a devolved Wales" - and, in our own narrow sphere of football, those of us who believe in Wales as a fully independent football nation know that they fail us. Although the authors' aim was to discuss the area of governmental policy towards Welsh media, the research nevertheless describes some wider trends and influences in broadcasting and publishing which throw new light on our own gripes about football coverage in Wales. Before examining whether the issues with coverage of Welsh football are part of a wider failing, we should explain in a little more detail what we perceive those issues to be. The first area of concern is the failure, on the part of the Welsh (and UK) media, to give the Welsh Premier League appropriate recognition befitting a national league in a European context. So, Welsh news and sport coverage on the main TV channels very rarely makes any reference to the league in its bulletins, live commentary and reports, results programming etc. The one exception here is S4C, which provides regular live match coverage and highlights for its (predominantly) Welsh language audience. Even when Welsh Premier League clubs represent the nation in the UEFA Champions League and UEFA Europa League, their matches are mentioned fleetingly, if at all, on Welsh news programmes. Secondly - and in a sense the corollary of the above - we have the massively Anglo-centric nature of football coverage in our media. Thus, the English Premiership dominates, with a greater awareness of, say, Manchester United, Liverpool and Chelsea in the general Welsh public than any club based in Wales. Added to this we have the peculiarity of football in Wales that a number of clubs based here play - by choice - within English, not Welsh, football. This is not a problem that any of the other UK football nations has to cope with - neither Scotland nor Northern Ireland has teams within their borders playing in a 'foreign' league. There is a historical reason for this, of course. But the size of the problem it represents becomes apparent when the media coverage of these clubs is set against the coverage of Welsh domestic football. Understandably, Swansea City (English Premier League) and Cardiff City (English Championship) figure most prominently - these are big-city clubs with large followings playing at a high level within the game. They are also playing in the competitions most closely followed by football lovers and gamblers alike. But the habit of Welsh broadcasters and 'national' Welsh newspapers of covering lower levels of English football - notably Newport County and Wrexham - in preference to Welsh domestic football, makes less sense. Live radio match reports on Saturday afternoons feature games involving these 'Anglo' clubs exclusively; the Saturday evening phone-in on BBC Radio Wales is widely trailed via social media with invitations to fans of Swansea, Cardiff, Newport and Wrexham to discuss their teams' performances; no such invitation is extended to fans of, say, Bala Town, Bangor City, Cardiff Met, or Gap Connah's Quay. Both in broadcasting and most print media, this seems ingrained both in policy and in the attitudes of key journalists, many of whom are openly contemptuous of the Welsh football system. On rare occasions when the Welsh Premier League is mentioned, this is, by definition, as a 'one-off' piece rather than ongoing coverage. So, whilst very welcome, the recent coverage (in Wales) of a record-breaking run by Welsh champions The New Saints maybe only highlighted the obscurity of the national league. By contrast coverage throughout Europe was more fulsome. The justification of these practices is always based on 'audience demand'. The accompanying assertion is that there's more interest among listeners / readers in Wrexham FC, although they play English non-league football, than in the Welsh Premier League. But this is disingenuous. Public awareness and interest do not arise in a vacuum - they are shaped, nurtured and maintained by media coverage. So, if BBC Wales Today mentions Newport County's and Wrexham's fixtures every Friday and Monday - but doesn't mention any Welsh Premier League fixtures - awareness of domestic football never grows beyond its existing base and the floating fan's propensity to try the domestic football experience is suppressed. The above paragraph is concerned with BBC output. Whilst broadcasting is only part of the 'landscape', it is worth repeating one very relevant line from the International Journal of Cultural Policy paper: "one consequence of the lack of a dedicated national press in Wales has been that broadcasting has historically filled the gap and developed as the main source of news for people living in Wales." So the influence of sports items on local news bulletins cannot be over-stated. The language dimension is also relevant: as mentioned above, it is the Welsh language broadcaster S4C which provides the Welsh Premier with its regular coverage. It is likely that ideas of Welsh nationhood, and thus pride in independent Welsh institutions like the Welsh Premier League and Welsh Cup, is more established among Welsh speakers. Whereas the more populous, English-speaking regions lag behind in commitment to such aspects of nationhood. So, either the disparity in coverage simply reflects this - or reinforces it. Or both. And finally, whilst on the subject of language, there is another factor which magnifies the size of the task facing those who try to rectify the imbalance football coverage in the English-language media in Wales: the fact that government subsidies to publishers are targeted at those publishing in Welsh. So - if we can make this parochial for a moment - when corporate English language media overlook Welsh domestic football, it falls to independents like Welsh Football magazine to try to redress the balance. But, as we do not publish in Welsh, we are excluded from any publisher grant funding that might enable us to reach wider audiences. So, alongside all the other factors, we're trying to operate on a playing field that resembles the slope at, say, Hakin United's Observatory Ground; not a level one, in other words. The previous section related ways in which the media in Wales fails to provide coverage of our national football competitions and our teams competing in Europe. Obviously it matters to those of us involved in domestic Welsh football, but does it matter beyond our football bubble? We would argue that it does matter; that pride in Wales and the development of a Welsh identity, in all walks of life, separate from England, is key to the growth of Wales as a devolved nation. So the still widely-held public view, reinforced by the media, that English football at all levels is superior to Welsh football, and that the latter is somehow a little embarrassing, is actively working against that evolution in attitudes. So, with the benefit of the insights into the media landscape in Wales provided by the International Journal of Cultural Policy article, let's consider to what extent the failures of our media to provide appropriate recognition for Welsh domestic football might be explained by wider factors in the broadcasting and publishing industries - or alternatively, whether they are peculiar to football. In this section, I'll examine points identified by the authors of that article, and examine their application to the specifics of football in the media. Those points are taken in the order in which they are made in the article. • On the question of whether Government policy for broadcasting should be fully or partially devolved to the Welsh Government, the idea of influence or intervention in favour of coverage of truly Welsh interests in sport, culture etc. is attractive, but the likelihood of it making any practical difference to editorial decisions regarding the content of broadcast sports coverage look very slim. • Against a background of devolved political power, the article identifies a trend for the English-language press and broadcasting media systems in Wales "to remain static or even retrench to a more centralised and concentrated ownership model with major editorial and commissioning decisions taking place outside the borders of Wales in the offices of both the main British broadcasters and the owners of local and regional press titles". This does strike a chord - anecdotally, we have heard of a lack of understanding or interest in the significance of national football competitions like the Welsh Premier League, when representations are made to editorial authorities in London, Salford, Liverpool or elsewhere. Later in the article, a quote from one of the UK's largest production companies contains the words "English language television is a key component of creating the new Wales and reinforcing the feeling of what it is to be Welsh." Which, we would argue, includes viewing our national sporting competitions like the Welsh Premier, Welsh Cup etc. with pride rather than embarrassment. • The article goes on to reflect on the BBC's policy of moving production expenditure out of London - pointing out that the reality is that most Cardiff-produced content in English is "orientated to a UK-wide and international audience, not to Wales specifically". So this de-centralisation of operations is not creating a regional entity with any specific Welsh identity or remit. The authors go on to say "This distinction matters .... , because national media systems ought to provide diverse representations of the nation to itself". We would concur whole-heartedly. We would hope for more enlightened treatment if we had a broadcaster with an objective of portraying a uniquely Welsh perspective rather than a UK one, with its editorial and commissioning decisions taken in Wales by staff with a understanding of the many expressions of Welsh identity. We think this applies in football, as in so many other areas of life. • Earlier in this article, we mentioned the disparity in treatment of Welsh- and English-language publishers in government policy. In a relevant passage, the International Journal of Cultural Policy article notes that "Most Welsh-language periodicals receive public subsidy... from the Welsh Books Council". Tellingly, it does not cite any such subsidy for English language periodicals. It also goes on to talk about calls for grant support for the hyper-local publishing sphere. Once again, it seems that publications like our own are overlooked - we're national, not hyper-local; but we're independent, rather than corporately-owned or backed, so we are left trying to be the voice of real, distinctly Welsh football within the periodical market with no form of support other than our own revenue-raising efforts. That we've done so for 25 years is a source of some satisfaction, but how much more of a difference might we have made with support? • In its conclusion, the International Journal of Cultural Policy article notes the history of "effective media activism" in the Welsh language and the "little comparable activism - either in scale or effectiveness to date - in favour of English language media in Wales". It also notes that the Wales Media Report (2015) and responses to it is a significant step in addressing this relative absence. Having earlier lamented ways in which we think the English language media fail the nation in our own sphere of interest, we welcome this conclusion, but with a note of caution. In our concluding analysis below, we discuss the prospects for change in the balance of coverage between domestic Welsh and other football. DO WELSH MEDIA INDUSTRY ISSUES EXPLAIN OUR PROBLEM? Earlier in this article we have summarised ways in which we believe the present media output in Wales falls short of the coverage of domestic, Welsh football appropriate to an autonomous national league system in a European nation. And we have noted wider media industry trends, reflecting on their applicability and relevance to the particular challenges of Welsh football coverage. Now it is time to draw the strands together, and to ask whether our problems in Welsh football coverage are caused by structural, systemic problems in the industry - or by factors particular to football in Wales. The weaknesses in the Welsh media identified by the authors of the International Journal of Cultural Policy article clearly contribute to the shortcomings in coverage of Welsh football and its domestic system. Editorial control from outside Wales, reduced broadcasting output for a Welsh audience, absence of a strong Welsh national newspaper industry, neglect of English language media in favour of Welsh - all these factors can, in their own ways, be said to have worked against the recognition, coverage and active support of the FA of Wales's attempts to establish a healthy Welsh football system separate from that of England. However, to attribute the state of English language media coverage of domestic Welsh football entirely to factors within media policy or the media industry appears unrealistic. For instance, the same factors haven't ever prevented the media from fervent coverage and support of the Welsh national teams - either in football or rugby union. Paradoxically, given the pro-English and anti-Welsh mind-set running through club football coverage, the opposite is true in international sport. Moreover, the picture is not uniform. When looking at the daily newspapers aiming to provide national coverage, whereas the south Wales titles fail Welsh club football, in north Wales the Daily Post provides exemplary coverage. Yet, like its southern stablemates, this title is controlled and run from England. It can be argued, therefore, that the failures of Welsh media to give proper recognition and coverage to domestic Welsh football cannot be wholly blamed on the institutions themselves. Do the attitudes of (some of) the nation's football editors and journalists actually based here offer an explanation? Fervent in their support of Wales as a national team, they surely cannot be merely slaves to editorial choices made in England. But the club allegiances of these experienced journalists have traditionally been to the Welsh clubs playing in England; they recall fondly the days earlier in their careers (almost all in the last century) when Cardiff, Swansea, Newport and Wrexham enjoyed FA Cup and European Cup Winners Cup glory. To them, that is Welsh football, and they cannot embrace the new Welsh order that relegates it to history. The new order, characterised by decline of all but two of the old order and the rise of clubs in the domestic system, represents a challenge. Are they reluctant even to allow it into their professional lives alongside what remains of the good old days? A similar - though less pronounced - disparity in coverage of Welsh football can be observed between the BBC Welsh offices. While some leading Welsh broadcast journalists do fit exactly the profile described in the previous paragraph, nevertheless in the case of broadcasting the influence of central editorial policies - set outside Wales - seems stronger. As the public's consumption of news undergoes major change, certainly the influence of newspapers in shaping attitudes - in sport as elsewhere in life - is in decline. Meanwhile, internet and social media news channels grow in importance. But there is a degree of self-selection in consumers of these channels - so while internet coverage of Welsh domestic football is growing, it tends only to reach existing converts - unlike television news bulletins where the viewer will encounter items both within and outside areas of existing knowledge and interest. For those reasons, the continued dominant position of broadcast media in Wales remains the key to football coverage. Whether it is likely to change remains a difficult question. The wider calls for more comprehensive, Wales-centric broadcast content in Wales - and policy initiatives to bring it about - are persuasive but by their nature long-term. In the meantime, football itself - the FAW, the clubs, and the supporters of Welsh football - will have to continue striving to influence, persuade - and where possible demand - that our national league and other competitions receive media coverage appropriate to a devolved (and, in football, independent) nation. Those of us who are passionately committed to providing that coverage will continue to do so, even if the playing field is far from level, but the wider debate on English language media in devolved Wales offers a glimmer of hope here. I will end with a plea: that this wider debate at least considers the need for some form of practical support to independent, English language periodicals like Welsh Football, to ensure our own contribution to the nation's cultural life can be maintained alongside the Welsh language sector. 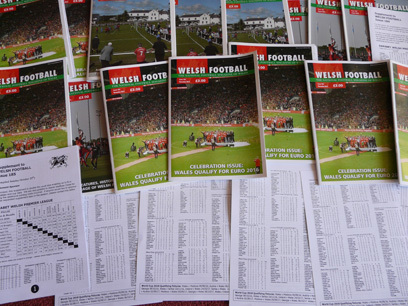 Welsh Football magazine is a publication devoted to all aspects of football (soccer) in Wales. It is run independently by football fans and operates on a non-profit-making basis. Although amateur by nature, the magazine is produced to high standards of professionalism in content and production. Our intention, as well as recording news and results, is to offer a positive, but independent view of football in Wales: never negative or controversial for the sake of it - but also prepared to be critical when necessary in the interests of the game. "Welsh Football" was founded in 1991 by writers who had been involved in previous publications including "The Welsh Football Almanac 1991" and the defunct magazine "The Welsh Footballer". The first issue appeared in January 1992 and the magazine has been published continuously since that time. Eight issues are published each season and are available by postal subscription or from a variety of club shops and retail outlets in Wales. Please use the contact details on this site to request further information. The aim is to cover every level and every aspect of football in every geographical region of Wales. Every issue contains news and views on the Wales national team and the major Welsh domestic league competitions. Other contents include: club features; a full regional round-up of minor leagues in every issue; historical articles; programme reviews and annual awards; book reviews; league tables and other statistics. "Welsh Football" relies heavily for its funding on subscriptions, sales at clubs and on the support of our major sponsors and advertisers, including Harris Printers of Porthcawl who have helped to develop the magazine to its current standard.